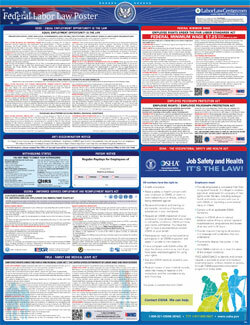 The Job Safety & Health Protection Poster (English) is a job safety law poster by the Federal Department Of Labor. This is a mandatory posting for all employers in Federal, and businesses who fail to comply may be subject to fines or sanctions. This poster must be posted in a conspicuous place by private employers engaged in a business affecting commerce. Does not apply to federal, state or political subdivisions of states. This poster describes how employees have a right to act when they believe there are in an unsafe or unhealthful working environment. The post also describes what employers must do if safety and health standards are not met in the workplace. Failure to post may be subject to citation and penalty. It appears you don't have a PDF plugin for this browser. Please see the link below to download federal-osha3165.pdf. representative contact OSHA on your behalf. speak in private to the inspector. retaliated against for using your rights. the workplace injury and illness log. reporting a work-related injury or illness. Comply with all applicable OSHA standards. of an eye within 24 hours. Prominently display this poster in the workplace. Contact OSHA. We can help. This poster is available free from OSHA.